Advertise Islamic Products and businesses . Assalamu Alaikum wa rahmatullahi Wabarakatuhu . I am Aafiya – the Owner and the Blogger of this Website . If You are looking to advertise your Islamic Business , I am offering the adspace of “Islam Hashtag ” at a very nominal rate . Website traffic – 2,64000 Session per month-96.4 million session /year . Alhumdulillah !” Islam Hashtag” is well received by both gender,Young and Old , We have Readers from all age group and readers from different religion and region . 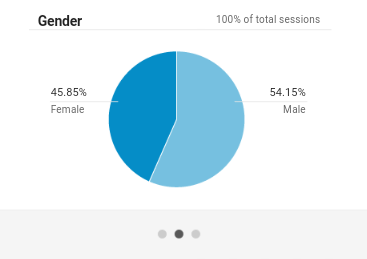 Here is a graph showing the gender distribution of Readers of Islam Hashtag . If You are interested in Placing an Ad in our Website or if you to promote your books ,apps etc ,You can Contact us at admin@islamhashtag.com . In Sha Allah We will get back to you as soon as possible.